A controller for input of flight commands (joystick). 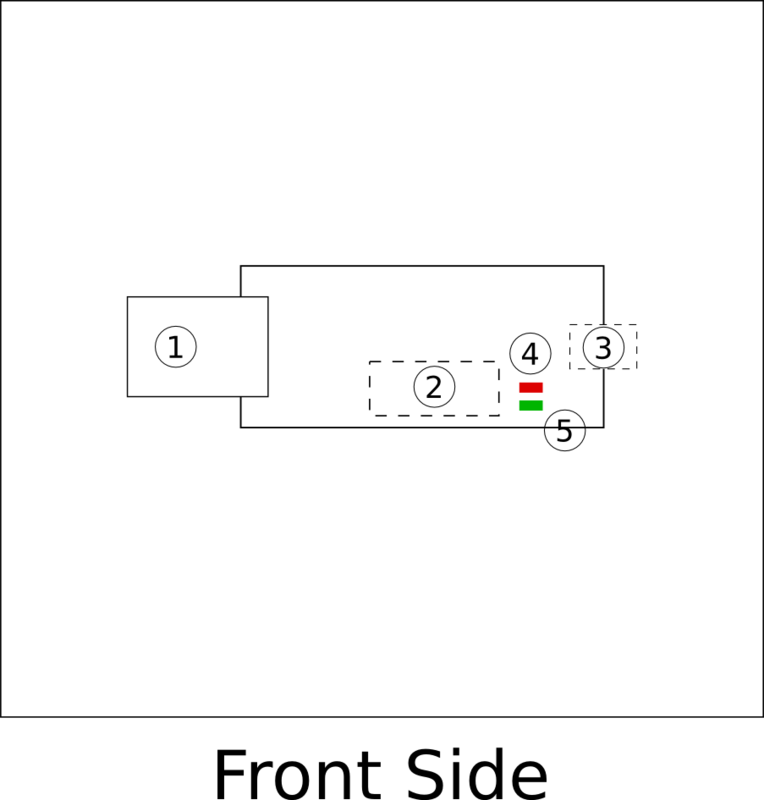 Currently Playstation 3 and Xbox 360 controllers are supported out of the box, but any controller with at least 4 analog axis can be configured and used. Se the input-device page for more information. The Crazyflie is controlled from a computer using an input device such as a game controller (PS3 or Xbox 360). A USB radio dongle is used to send control data from the controller/computer to the quadcopter. 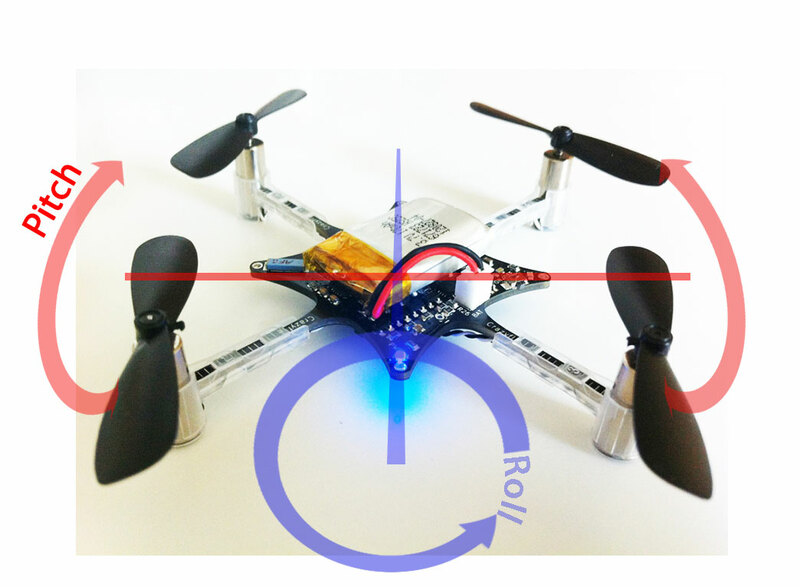 The Crazyflie has 4 different controls: roll, pitch, yaw and thrust. Changing the roll and pitch will make the quadcopter tilt to the sides and thus change the direction that it's moving in. Tilting the quadcopter forward will make it go forward and the same applies for every other direction. Note: the images below show the front as setup in X configuration. Normal (out of the box) configuration has the front inline with motor M1. 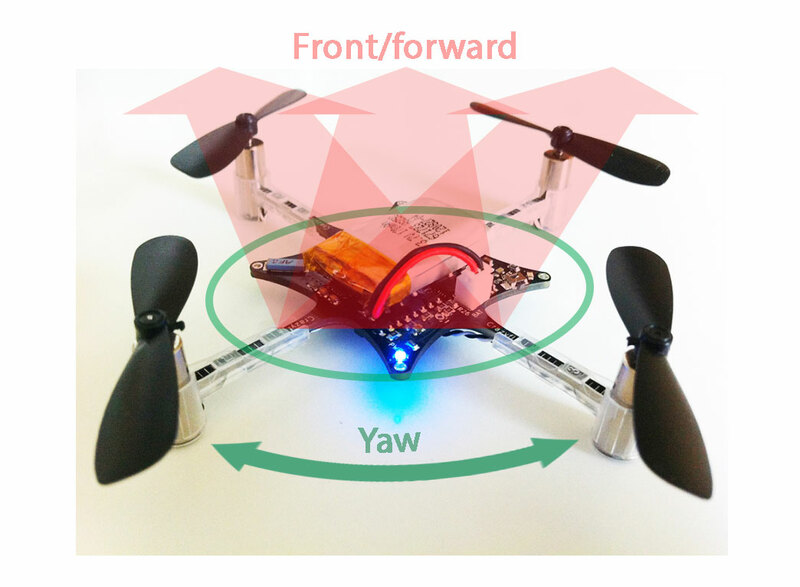 Changing the yaw will make the quadcopter spin. Changing the yaw is normally not a good idea for beginners since this will also change what direction is forward for the quadcopter. The thrust is used to control the altitude of the quadcopter. The frequency used communication is based on 2.4 GHz. For every quadcopter it's possible to set a channel between 0-127 (only 0-80 is allowed worldwide) that will be used for communication. This means that once the channels is set for a quadcopter you will have to specify the appropriate channel when communicating with it. The channel can be set within the service tab of the Crazyflie client pc-program. Hold the Crazyflie stable during the start-up, otherwise the sensor tests may not pass. 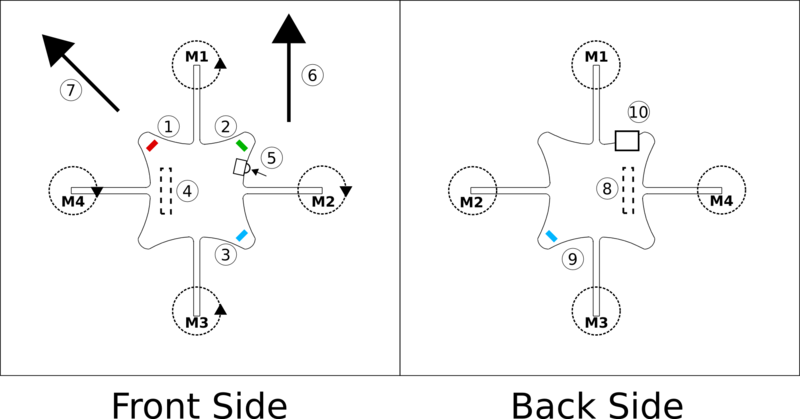 Each motor will quickly turn on to indicate that they are working. Wait until the red LED shows that the sensors are calibrated by increasing the blink rate from 1Hz to 2Hz. When the red LED is continuously lit or/and the copter becomes uncontrollable the battery is low. Recharge and start over. For more tips on flying take a look at the tips and tricks page. Below are the basic components mapped out on the Crazyflie. Green LED - Shows radio communication and charging status. Front direction when flying in X configuration, blue LED is at the tail. The Crazyflie has four LEDs mounted, two blue, one red and one green. The two blue LEDs indicate that the system is powered and the red/green shows operation. When the Crazyflie is powered the two blue LEDs will be lit up and the red/gren LED will blink shortly indicating that the bootloader is executing. After this the firmware will start up. Tests failed: 5 quick flashes. This can be caused by too much movement of the Crazyflie when powering it on. Try putting it on a stable surface and try again. Charging: Blinking at 1 Hz with a duty cycle showing the battery charge level. The longer on time the more charged the battery is. Sensors calibrated: 2 Hz heart beat. Crazyflie now ready to fly. All these behaviours can be compile time configured. In the future they might as well be able configurable during runtime using the Crazyflie client. If the Crazyflie hasn't received any commander package within 2s it will turn off the all motors. If the Crazyflie hasn't received any commander package within 5min it will automatically shut down.